Eyes: Rich ruby and garnet. Nose: Crushed cherries, black tea, cedar. Mouth: Energetic structure, framed by cranberry spice, savory black tea, and ripe cherries. A stylish, elegant, medium-bodied wine, aged in neutral oak, allows the varietal character and the volcanic terrain of the eastern Rutherford hillside to shine through. Bright acidity and polished fruit tannins on the finish. 2014 was another spectacular growing season in the Napa Valley, though it brought lower yields than the bumper '12 and '13 vintages. We received over 12" of rain in February and March, followed by a dry, temperate summer with zero days above 100 degrees. Another early harvest brought delivered fruit with excellent energy and character, highlighted by vibrant acidity. 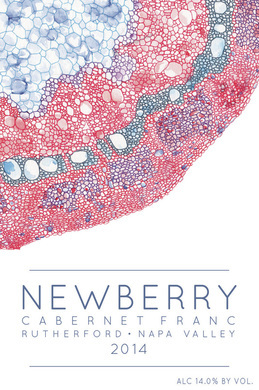 The Cabernet Franc hails from the eastern hillsides of Rutherford. This site is planted to Clone 1 Cabernet Franc, 800' above the valley floor on iron rich, gravelly loam soil. The well drained soils keep canopy vigor and fruit yield in balance. A family owned site being managed by the same crew for over 30 years. Very fortunate to work with this fruit sustainably managed source! By harvesting at optimum ripeness, we let the varietal provide the acidity and tannin structure, with slight touches of new French oak to polish the mouthfeel. Cherry and cedar aromatics, blackberry pie, crimson mid-pallet, vanilla, currants and rosemary on the finish. This ﻿is an elegant, well-structured, versatile wine ﻿that you should be proud to share.